About a year ago, I visited Rome for Roma Cocktail week for a symposium on the World's 50 Best Bars where I met Giampiero Francesca and Diego Ferrari. We all decided that the future of the bar world was in Southeast Asia, with the capital of course being Singapore. Since I had formed some friendships with key players in the Singapore industry, we decided it would be awesome to showcase the best of Italy in the thriving Singaporean market. Through master classes and guest shifts, we wanted to educate both consumers and industry in Singapore about the amazing way we drink in Italy, from the aperitivo to the after dinner digestivo. In Italy, we have the best drinking culture in the world. Evidence of this are the popularity of the aperitivo style worldwide, and the heavy use of Italian vermouth, bitters and spirits and international cocktails. One great example is of course the magical Bar Termini in London. We were able to organize The Flavors of Italy in Singapore thanks to the generous support from Luxardo (sour cherry and dry gin, fernet, amaro abano, bitter bianco), Cocchi (vermouth storico di Torino, dopo teatro, americano), Campari (bitter, Cynar), Michter's (rye and bourbon whiskey), Castagner (Casta and 7yo grappa, Amaro Leon), Marzadro (18 lune and Amarone grappa, Amaro), Pallini (limoncello, Ferro China Bilva, Mistrà), Mazzetti (7.0 grappa di ruche, Gaia Mazzetti Riserva, Amaro) and Liquore delle Sirene (bitter and cocktail bitters). In discussing with Zdenek Kastanek of Proof and Co, we became aware that there would be two new exciting Italian-inspired cocktail bars in Singapore that would be perfect for the events. To take advantage of the large number of international industry people in town, we organized our events during the popular Singapore Cocktail festival, which in my opinion is the most important cocktail week in the world. complement a premium selection of Italian cocktails. Therefore with our guest bartender Benjamin Cavagna of 1930 Milano, we wanted to focus on digestivi and amari, as both stand alone spirits and in cocktails. May 7, Benjamin gave his master class on the after dinner Italian drinking ritual and then served cocktails during a fun guest shift, where consumers and trade packed the intimate and elegant Marcello bar. The success of the event wouldn't have been possible without the amazing organizational skills of the Marcello head bartender Palmira Bertuca. 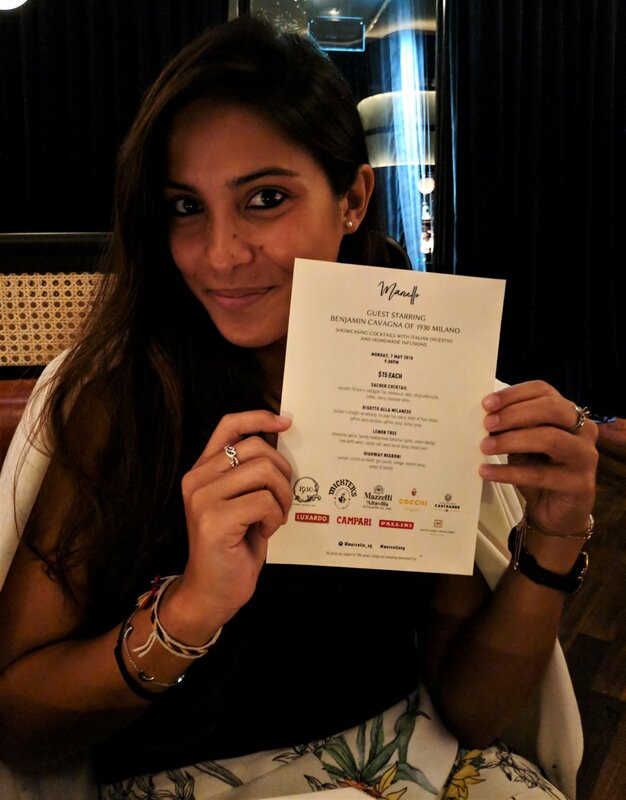 The second bar for The Flavors of Italy in Singapore was Caffe Fernet, a new Jigger and Pony project which focuses on Italian-inspired dishes and favourite Italian cocktails delivered with “sprezzatura”. Caffe Fernet is located at 70 Collyer Quay with a breathtaking view of Singapore River. On May 9, Diego Ferrari of Rotonda Bistrò Milano and Cocktail Art held an afternoon master class on the Italian culture of drinking, which was very well attended by both trade and consumers alike. 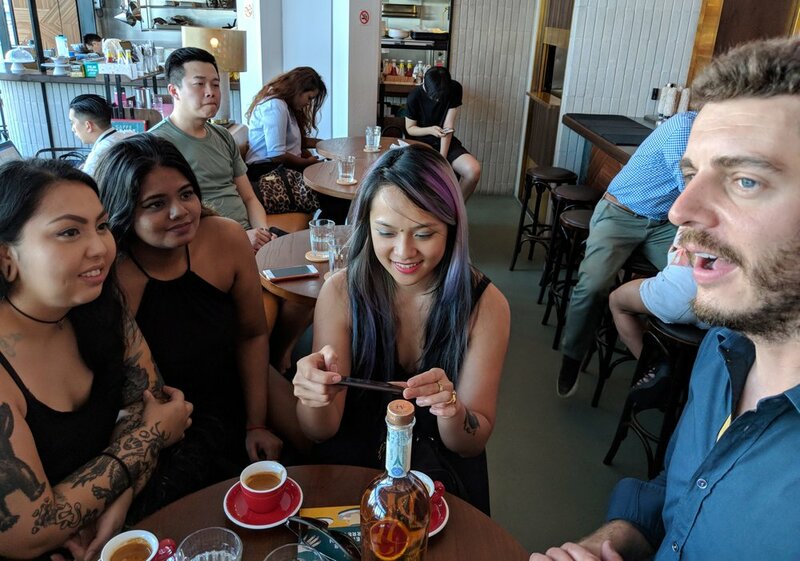 The highlight of the event was at the end, when Diego and Caffe Fernet bartender Cherrie handed out Italian espresso to all the guests, asking them to "correct" their coffees with a grappa, amaro or liqueur from one of the sponsors. Since representatives from Pallini, Marzadro, Castagner, Luxardo and Cocchi were in attendance, it was a nice opportunity for the participants to ask questions directly to the producers. Then later that evening, Diego had his guest shift “A Negroni Affair with Diego Ferrari", where he presented 5 different Negroni-style cocktails using the ingredients so kindly provided by our sponsors. Overall we were extremely proud of the events, with master classes at capacity and many cocktails purchased at both bars. It was not a simple matter keeping 9 brands, 2 bars and 2 bartenders happy, but in the end, the events went very smoothly, with everyone having a great time and we received many positive reviews from the attendees of the Flavors of Italy events. What is the future for The Flavors of Italy? If all goes well, we can bring this exciting project back to Singapore next year but also to other interesting markets. A special thanks to Palmira of Marcello, Cherrie, Aki, Charmaine and Indra of Caffe Fernet, Rachel, Mimi, Hutch, Benedict, Ethan, Sarah, Neil, Zee and Paul from Proof. Without them, these events would not have been possible.